SUGAR GROVE, Ill. (WLS) -- A small plane made an emergency landing in a corn field in Sugar Grove near Aurora Airport Friday morning. The Kane County Sheriff's Office as well as the Sugar Grove police and fire departments responded at about 7:10 a.m. to the area after a report of a small plane landing in a corn field. The sheriff's office said that the pilot, who said he was not injured, directed authorities to his plane west of the airport and south of Scott Road. 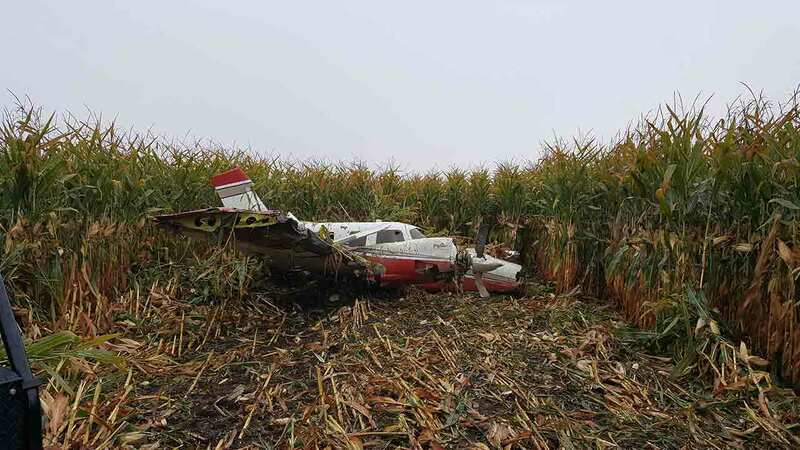 Authorities initially had trouble locating the Piper Seneca because the corn field has not yet been harvested. A hook and ladder truck was used, and the pilot was able to find the truck and direct authorities to the plane, the sheriff's office said. His wife was also in the plane. Both are ok and have been checked by medics and released. The pilot said he had just taken off from Aurora Airport and was flying to Arizona when he experienced an emergency. The FAA and NTSB are investigating.